The accelerating pace of scientific publishing and the rise of open access, as depicted by xkcd.com cartoonist Randall Munroe. This final topic was possibly the most relevant in regards to our higher education. Quality research and dissemination of information is imperative for academic study, though for me many of the issues raised were also important for the development of this blog. The general consensus amongst students was an inherent need for Open Access as it offers great benefits for authors, researchers, students and society as a whole. This week I spent a great deal of time on the Directory of Open Access Journals (DOAJ), Public Library of Science (PLOS) and PubMed reading through articles relevant for my Psychiatry posts (see below). I was impressed with the efficacy and navigation of these sites, the searches worked very well and I was able to find useful studies in seconds. PLOS and PubMed were significantly useful for credible scientific research and I would highly recommend their use to others, although PubMed is a search engine for references and abstracts on life sciences and biomedical topics, thus content isn’t necessarily open access. I believe it’s important to know why we must pay for information. Essentially, peer review is of utmost importance in order to sustain integrity and share approved contents worldwide. For this reason, costs for open access journals consist of peer review, manuscript preparation and server space. In terms of the bills Open access journals pay they include payments of production costs for disseminating content, though Universities, governments or Professional organisations may provide a subsidy. Some researchers (or their sponsors) must pay a processing fee on accepted articles, although this can be waived under certain circumstances (i.e. affiliation with institutions that have purchased an annual membership, economic hardship etc..) and subsidized journals are generally exempt. Regarding the perils of Open Access one study stood out for me. A hoax, was initiated by John Bohannon, a science journalist at Harvard University. He wrote a paper on a simple test of whether cancer cells grow more slowly in a test tube when treated with increasing concentrations of a molecule. The paper had ‘fatal flaws’ and used fabricated authors and universities with African affiliated names. Bohannon submitted around 10 articles per week to open access journals that use the ‘gold’ open access route, which requires the author to pay a fee if the paper is published. This was accepted by 157 of the journals and rejected by 98. Of the 255 versions that went through the entire editing process to either acceptance or rejection, 60% did not undergo peer review. Of the 106 journals that did conduct peer review, 70% accepted the paper (Shaw, 2013). This is a prime example of the risks we face online whilst looking for credible sources and references that relate to our education; which is why I advocate the use of established platforms like the PLOS and PubMed so we can avoid using and sharing low quality and inaccurate information. Infographics, (2013). 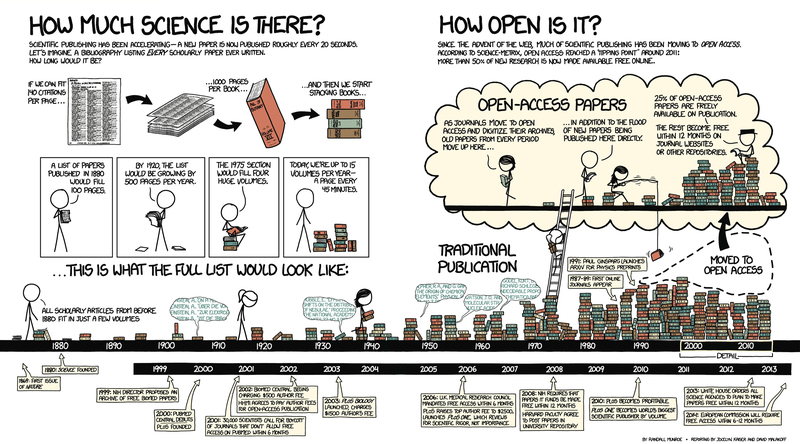 The Rise of Open Access. [image] Available at: http://www.sciencemag.org/site/special/scicomm/infographic.jpg [Accessed 11 May. 2014]. Why do we engage in Self Deception? Open access to online materials for all: Utopian dream or unstoppable force? Issues of Mental illness Diagnostics.